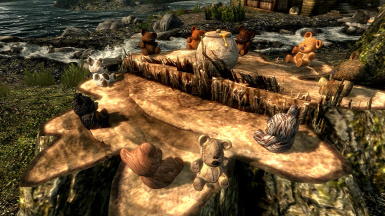 Teddybears as modder's resource and as collectable toys. Ten different teddy available. You may use the meshes and textures for your own mods as long as you give credit to the authors including the creator of the original model and you do not charge money for it. 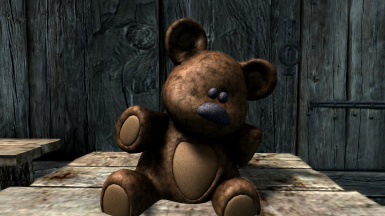 Original model of the teddy: Abitor (http://thefree3dmodels.com/stuff/accessories/toon_teddy_bear/21-1-0-2215). Please vote for the file on that site of you like the teddy. Arion: Additional textures, creation of all normal maps and environment maps. First of all this is a modder's resource. 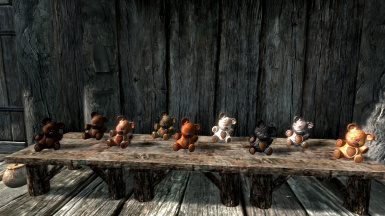 The teddy-bears come with nine different textures. You may use the meshes and textures for your own mods as long as you give credit to the authors including the creator of the original model and you do not charge money for it. 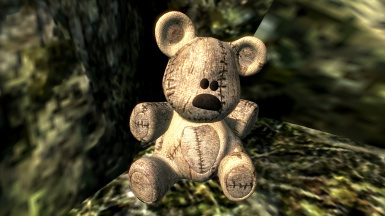 We decided to add a demo esp for a preview in game and for those players who are not acquainted with the Creation Kit but want a teddy to take away. 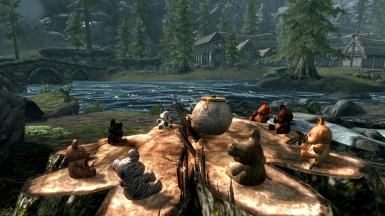 Rumor has spread around the last shy teddy-bears that live in the woods near Riverwood that someone forgot a honey-pot by the river. So the last existing teddy-bears gathered there to have a banquet and a chat. Look for them outside Riverwood on a tree-stump to the left at the end of the bridge. Take care and be good to them. Brodual kindly has included the teddys in his weekly Bits 'n' Bobs video #8, thank you very much! 3. Find the Teddy's in the specified location. 2. Remove any files associated with the Teddy's from your Data Folder.